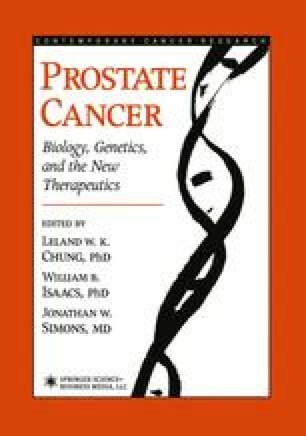 The systemic treatment of metastatic prostate cancer began with the discovery by Huggins and Hodges of the effects of estrogen in patients with advanced disease (36–38). However, it became clear that the majority of patients become refractory to this treatment. Many trials have investigated a multitude of agents, searching for an effective treatment for men with hormone refractory disease. These studies were limited by the natural history of the disease and the limitation of radiological studies to assess response, and progress was slow. The emergence of prostate specific antigen (PSA) as both a surrogate marker of disease burden and response in patients with advanced prostate cancer revolutionized the study of chemotherapy in hormone refractory prostate cancer. Response was now easily quantifiable. Also at this time, chemotherapy regimens began to be designed based upon evidence of preclinical activity. New agents also became available with increased activity. Currently, a variety of chemotherapy regimens are available which can substantially reduce tumor burden in approx 50% of patients treated. This reduction in disease has been associated with improved quality of life. New regimens with enhanced activity are being developed. Also, research to investigate the expanded role of chemotherapy prior to prostatectomy or radiation therapy is currently underway.